After returning from my 25th wedding anniversary vacation with my wife, it was time to catch up on some dad time with the kids. With my nine-year-old son it was a Saturday morning Netflix movie – his choice. And as nine-year-olds would have it, his choice was less than a cinematic masterpiece. As a matter of fact, if it wasn’t a straight to video production, it should have been. It was the sequel to Disney’s animated film Lilo and Stitch – Stitch Has a Glitch. I know what you’re thinking. I didn’t know there was a sequel either – at least not until that Saturday morning. You may remember the story-line of the original Lilo and Stitch. An evil alien scientist creates a series of evil creatures, and one of them, experiment 626, escapes to earth – to of all places – Hawaii. Not a bad choice for an alien creation. There he encounters an orphaned girl named Lilo, who is being raised by her older sister. Lilo renames 626 Stitch. The story is full of adventure and misadventure but in the end, Stitch, who was created to be evil, is won over by Lilo’s unconditional love that was founded in the Hawaiian word for family – Ohana, (no one gets left behind). As a result, Stitch is reformed, becomes part of Lilo’s family and we all hug our kids as we exit the theater. And then there is the sequel. Let me say right up front, the movie was not great. The redeeming factor for this film is the rarity that a spiritual truth is presented with such clarity yet unintentionally. In this case, it is the folly of human propensity toward works righteousness. You see, in this second installment, it is revealed that when Stitch escaped his planet, he did so before receiving the full electrical charge he needed as an evil creation. This deficiency left him with a dormant glitch in his genetic structure that begins to surface; and is made evident through a series of episodes. In these episodes he returns to his former evil self, wreaks havoc and then awakens not knowing what happened or why Lilo is so angry with Him. 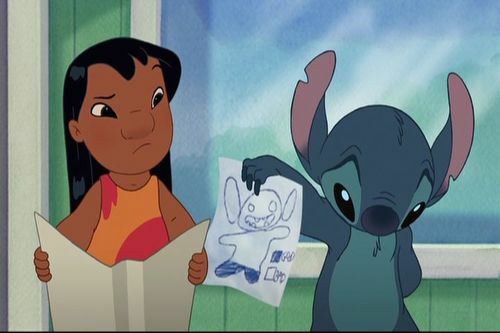 She becomes so frustrated with Stitch’s antics and his seeming lack of awareness of what he’s doing that she draws him a picture to clue him in. The picture is an outline of Stitch all colored in. It also included a key at the bottom: all colored in means the “good Stitch” and not colored in (just the outline) means the “bad Stitch.” And throughout the movie, as Stitch continues to perform poorly, he erases the colored in portion (the good Stitch) bit by bit until all that is left is the outline (the bad Stitch). At which point this tiny alien came face to face with his glitch – which sadly, in spite of his desire to be good, continued to plague and eventually kill him. But of course a Disney movie couldn’t end like that. So, in a tearful plea, Lilo pledges her love for Stitch. And her love for him resurrects Stitch and, of course, they live happily ever after. It may not be as clear in this brief summary of the film, but if I didn’t know better, I would believe that this script was written as an extended skit in support of sanctifying grace; thinly veiled in a poorly made animated film. Here is the truth that shouted from the screen. As Lilo rescued the lost and depraved Stitch in the first film, most Christians would acknowledge that we have been rescued from our helpless sinful condition and brought into God’s family by God’s One Way love for us through Christ’s substitutionary sinless life and sacrificial death in our place; in spite of our inability to help ourselves (Eph 2:1 – 9). Through Christ’s unilateral act, we became the Ohana of God. However, it is often at that point that we begin to see God much like Lilo in most of this sequel. Though He brought us in through His love and grace, now He is all about holding up a picture of what we should look like as “Good Christians;” expecting us to color in the blank outline of our lives with all of our best and holiest of efforts. Unfortunately, if we are completely honest about how well we are doing with that endeavor, we are much like Stitch, using the eraser end of the pencil much more than the coloring end. We can’t “fulfill all righteousness;” because, like Stitch, we too have a glitch – indwelling sin. As Luther famously said, we are simultaneously just/ified and sinner. As Savior, Christ made us His Ohana once and for all. But since we never cease being sinners, we need Him not to judge our works – but to be our Savior though His. We are not capable of coloring in our own picture of perfection, nor do we need to – because our perfect substitute’s picture hangs in its place. The Lilo at the end of the movie better demonstrates how sanctification actually works, as her love for Stitch raised him from the dead. It is only when we realize that the One who called us to be His through His One Way love, continues to love us with that same love, in spite of our glitch, that our glitch can be overcome and our dead and resident hearts are raised to life. It is when we are loved like we are the Ohana of God, even when we deserve to be treated like the black sheep, that our desires are stirred to “walk worthy” of our family name. That is the work of sanctifying grace – and sometimes that blockbuster truths come to us in straight to video packages. Previous Previous post: Is Ignorance Really Bliss?